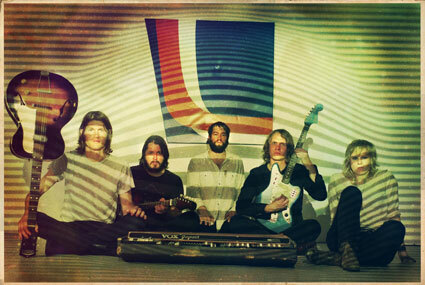 The label “psychedelic rock” is often applied to the Black Angels, and the group doesn’t shy away from the tag. 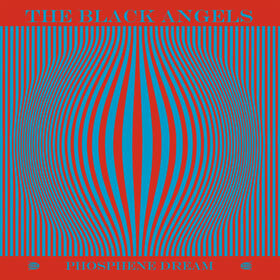 But the Black Angels view the genre more as a means of reaching a transcendental state of sorts. “Psychedelic music has been around since the dawn of time,” Alex Maas (lead vocals, bass, organ, guitar, percussion) argues. He cites the image of prehistoric man beating bones against cave walls and hearing the resulting reverberation. “Psychedelic rock,” he notes, “began here in Austin Texas, with the 13th Floor Elevators.” Maas also mentions the notorious band/cult Yahowa; he believes they “brought psychedelic music back to that caveman style.” Among (slightly) more modern acts keeping the style alive, he mentions German avant-garde collective Can and NYC electronic punkers Suicide; for Maas the particular style is less important than the mindset. In a bit of a departure from the band’s earlier discs, the band’s latest Phosphene Dream features relatively concisely structured songs. Maas says that those compositions “started long, but we whittled them down for the record. And when we play them live,” he chuckles, “we expand them again.” Those songs were collaboratively developed in the studio, not ahead of time. “We went into the studio with [producer] Dave Sardy, and would actually make a song out of the sounds we were creating.” Maas says the band was pleased to have in Sardy a “sixth mind to bounce ideas off of, someone outside the band.” Another deliberate and significant departure from earlier Black Angels material is Phosphene Dream’s more out-front mixing of the vocals. The April 2 show at the Grey Eagle was the band’s second Asheville visit within five months; the Black Angels’ “Dropout Boogie Tour” came to town last November, supporting Vancouver-based Black Mountain for an enthusiastically received, packed-house show. “All our shows in Asheville are magical for some reason,” Maas says. An edited version of this feature appeared in the March 20 2011 print edition of Mountain Xpress.